Reviewer's Note: This is part 3 of the Transformation series, preceded by Dark Intelligence and War Factory. This review will not be mindful of spoilers from those books. The spoiler-free review is that this novel could almost stand on its own as it's fairly contained within its own starfaring story for being the third chapter in a trilogy. 9/10. Following immediately after the events of the showdown at Room 101, Infinity Engine still follows Penny Royal's pawns as it moves towards its end game. While Penny Royal has neutralized most threats to its existence, and manipulated others to its own ends, it cannot account for The Brockle, an insane AI who's recently escaped its own prison. With the Polity and the Prador kingdom still concerned with what the end goal is, and The Brockle as the wild card, all of the spinning plates have to land somewhere, and they sure do make a mess, in a good way. Here's the struggle with writing a trilogy, or any book series; it has to go somewhere. I can safely say that the conclusion of the Transformation trilogy is satisfying. That's some of the highest praise I can give any novel, as, if you've read my reviews you might know, so many books botch the endings. Asher's experience at spinning long-tailed stories is obvious here. This isn't his first book series, and each novel in this trilogy has a conclusion that supports the individual novel as well as the overall story. If you've read Dark Intelligence, I'm happy to report that it's worth seeing the series to the end. As with the previous two novels, Infinity Engine has largely the same characters you met at the start, but it still somehow expands the universe. Stuff that gets pointed to in the first novel receives more attention and becomes more important here, which connects the story in an effective way. The novel is still sort of magical in that Asher can more or less make anything happen and wave his hands with technology beyond our grasp, but it's a fun read. I have to take a little bit from it though for cheating. The reason the end goal seems so elusive in the first two novels is that it's not even present until the third. I may be mistaken because this series has been spread across three years and some small details may have escaped my notice, but the very first chapter of this novel introduces something very important either was completely absent from the first two novels, or wasn't given a second glance. Of course an AI with seeming omniscience can seem inscrutable when the reader isn't given the full picture. We can't connect the dots when the last couple dots aren't even on the page. 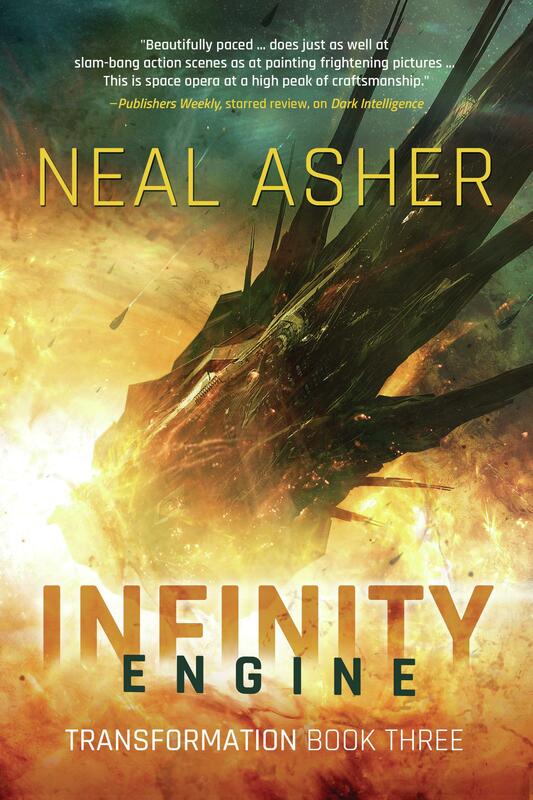 In these circumstances, someone could almost pick up Infinity Engine, read the cast of characters from the start of the novel, and still get an exciting story without ever reading the previous two novels without being particularly left behind. Way back in my review of Dark Intelligence, I called that novel "solid sci-fi combined with excellent universe building". That description could be applied to all three novels in this series. Infinity Engine reaches a well-built crescendo that makes the whole trilogy greater than the sum of its parts. Even though you could take Infinity Engine separately from the rest of the trilogy, you shouldn't. It's good, but the supporting novels make it great.